Want to highlight your hottest products or increase sales of a new service? Brand your business and increase sales with eye-catching posters of your latest products, window perfs to draw customers into your business or floor graphics to promote your brand, mission or service. Signage doesn’t have to be promotional only, it can be creative and add to the overall look of your business as it sells your product and your brand. Back-lit displays work well in low light situations. Floor graphics can be contour cut into any configuration and with a slip resistant overlay are safe for almost any environment. Table top displays from simple table tents to mini-banners can promote specific specials, a silent auction, event sponsors or upcoming shows. 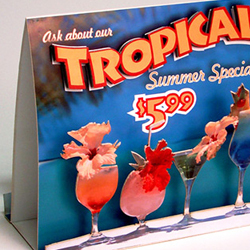 Posters are a low-cost alternative for shorter term promotions. Window clings offer short term promotions on both the inside and outside of your windows and are easily removable. Window Perfs provide a longer-term window solution that does not obstruct outside views. Floor displays work well inside your business or in a trade-show booth. With guidence from our professional graphic design team, we can help you choose the appropriate size sign and material for your needs. We’ll also work with you to use your signage as part of your overall branding strategy. By creating a unique look that works together with your company logo, your interior signage can do more than provide information, it can sell your product. Check out our idea gallery for samples of how interior signage can help your business.